Technology | West Loh on Leverage, Automation and Outsourcing Strategies, 100% Free! Speak it! 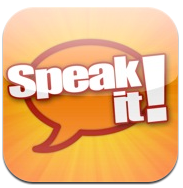 App Review: Transform Text to Speech and Leverage Your Time! Copy emails, documents, web pages, PDF files, and more; paste them into Speak it!, and have the text spoken back to you with the highest quality text to speech engine available anywhere. You can even create the same quality audio files of the text to speech which can then be emailed to anyone you like!